A University of South Carolina student with a lot to learn about both racial tolerance and computer networking was suspended for her ignorance on Friday, the result of a viral photo that showed her listing "niggers" as the primary reason "why USC WiFi blows." "Today, the unfortunate and disappointing act of a student in a study room has challenged the Carolina community to reflect on our values and tell the world what we believe," wrote university president Harris Pastides in a statement announcing the suspension yesterday. 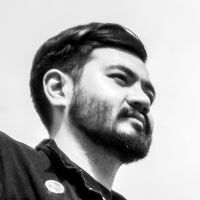 "Racist and uncivil rhetoric have no place at the University of South Carolina." 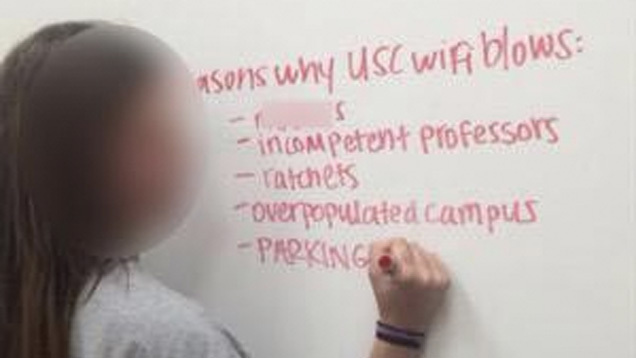 The incriminating photo, which appears to have originated on Snapchat, shows the student additionally listing "ratchets" and "PARKING" as other (equally unlikely) explanations for the school's poor wireless performance. Asked by the Associated Press whether the student faces expulsion, a school spokesperson declined to comment.